Black Legion Camouflage Folding Karambit | BUDK.com - Knives & Swords At The Lowest Prices! 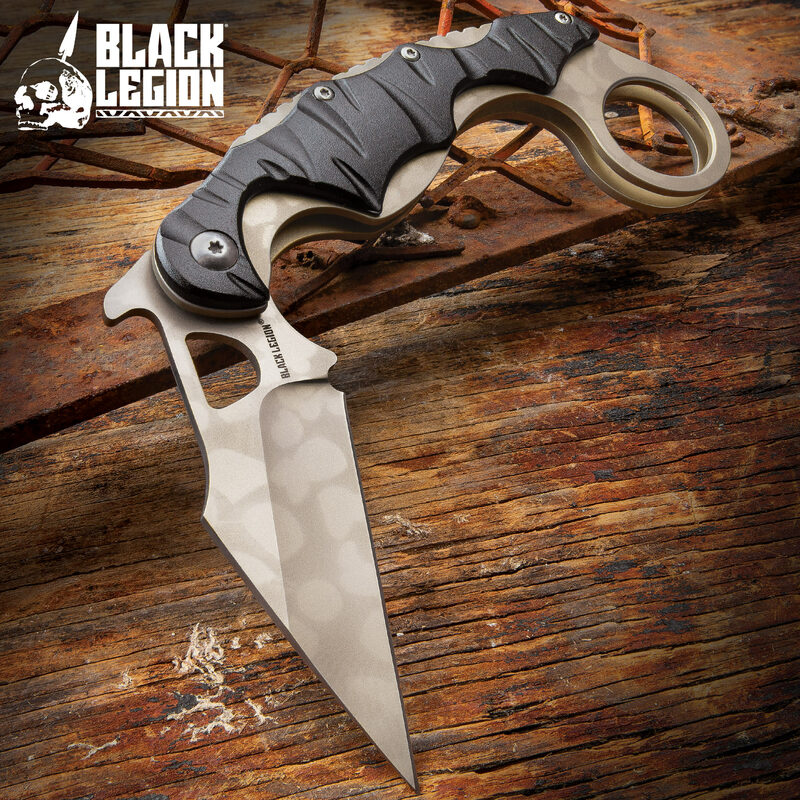 Black Legion’s Camouflage Folding Karambit puts the power and might of a traditional karambit conveniently in your pocket. 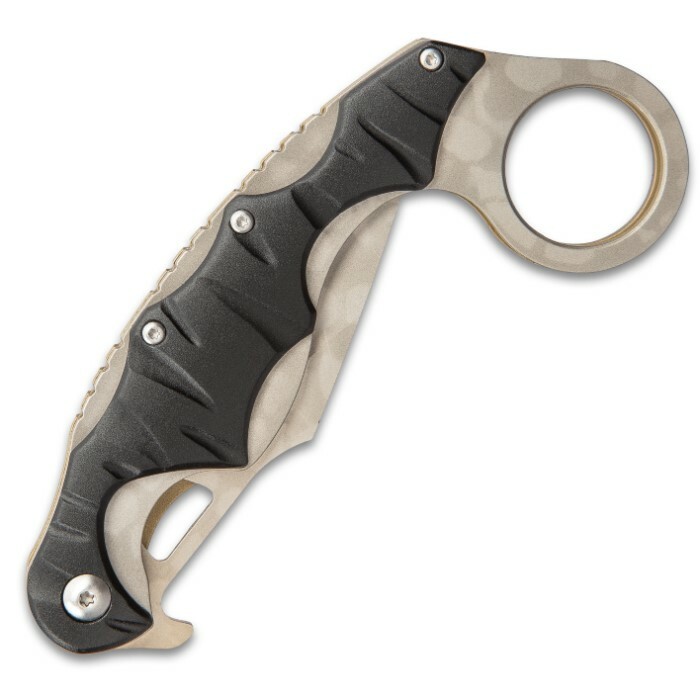 The 3 3/4” stainless steel karambit blade has an enhanced camo pattern which runs all the way through to the thumb ring. The convenient flipper lets you easily access the blade at a moment’s notice. The black G10 handle features ergonomic grooving for a secure and comfortable grip. Granted that this is one a folding knife, and two a different shape. It’s design is reminiscent of KaBar TDI, and is quite functional as a knife. I have had it for a couple of days and enjoy opening boxes with it, cutting electrical tape and even just playing with it. It is not a traditional kerambit by any means, and while Mall Ninja-it does have more uses than just looking tacti-cool. This is a display piece, only. There is no intelligent way to hold, or use this knife. 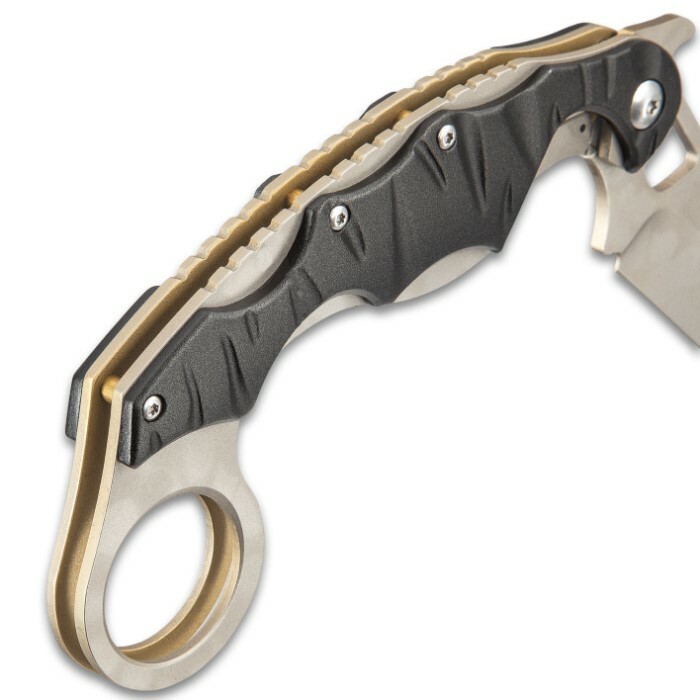 The blade does not open fully, so it's not a knife, but it doesn't function as a karambit either. Interesting collectable though, and nice finish on the blade. This is my Favorite knife, and I don't like picking favorites! Even closed, you have a SWEET (one) knuckle duster, and a formidable skull crusher! Wish that I would have bought more, with the free shipping offer. Carry is sweet too. I carry mine in my waistband, to the right of my ab (I am left handed), makes for a great draw, if ever needed.